Watch Si Lapulapu, Si RosasPandan: a Bisaya Musical Extravaganza on November 22, 8 p.m. at the CCPTanghalang Nicanor Abelardo (Main Theater). The press conference of Si Lapulapu, Si Rosas Pandan: aBisaya Musical Extravaganza doubled as a crash course on Visayan languageand culture. According to Baltazar Endriga, president of Kadugong Bisaya, the tiniklingis not of Tagalog origin but it originated in Leyte as an imitation of the tiklingbird that dodges bamboo traps set by rice farmers. Considered to be the national dance of the Philippines,dancing the tinikling involves two people hitting bamboo poles on theground while one or more dancers step gracefully over and in between the poles. He also informed the press that Christmas carol, "Ang Paskoay Sumapit," is actually a Tagalog adaptation of the Visayan "Kasadya NingTaknaa." National Artist for Literature and Music Levi Celerio is credited forwriting the lyrics in Tagalog. Mr. Endriga emphasizes, "The richness of the Philippines derives from therichness of the regional cultures." Kadugong Bisaya, the national organization promoting Visayanlanguages, culture and the arts, will showcase the region's rich heritage bytapping well-known Visayan personalities to topbill the musical extravaganzascheduled to take place this Saturday, November 22, at the Cultural Center ofthe Philippines. The concert is set to start at 8 p.m. at the Tanghalang Nicanor Abelardo (Main Theater). The star-studded event will feature performances from VerniVarga (who portrays Rosas Pandan) and Cesar Montano (who is cast as Lapulapu).Elizabeth Ramsey and her daughter Jaya will conduct the "Waray Waray" segmentwherein they will be teamed up with the group Airdance. The Philippine MadrigalSingers will perform Yoyoy Villame "classics" as a tribute to the noveltysinger-composer who passed away in 2007. Other performers are Rachelle Gerodias, Jose Mari Chan, thePhilippine Dance Sports association, Noni Buencamino, Raki Vega, DeedaBarretto, Jerry Dadap's Andres Bonifacio Choirs, Ballet Philippines, ModernBallet Dancers, and the Ramon Obusan Folkloric Group. The director of the program is Chris Millado, who happens tobe an Ilonggo himself. "We chose Lapulapu as the symbol of the warrior whileRosas Pandan evokes celebration," explains Direk Chris. The musical extravaganza will showcase Visayan history,culture, music, dance, and theater with the participation of notable Visayansingers, composers, actors and actresses, and choreographers, well-knownchoirs, ballet groups, and the Philippine Philharmonic Orchestra, conducted byJosefino "Chino" Toledo. Si Lapulapu, Si Rosas Pandan also celebrates several venerable Visayancomposers, lyricists or singers such as Jovita Fuentes (Ay Kalisud),Gregorio Labja (Usahay), Ben Zubiri (Matud Nila), Manuel Velezand Jose Galicano (Sa Kabukiran), Maning Villareal (Kahibulongan),Manuel P. Velez (Rosas Pandan). Cameo appearances will be made byVisayan cinema personalities like Gloria Sevilla, Caridad Sanchez and VirgieSolis. Barely a month to Christmas 2008, curtain call music will be the rousing"Kasadya Ning Taknaa," the original Bisaya Christmas carol. 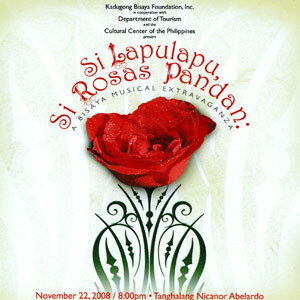 Tickets for Si Lapulapu, Si Rosas Pandan: a Bisaya Musical Extravaganzaare available at the CCP Box Office, with Tel. Nos. 832-3704 and 832-1125 local1409.